The questions we get asked most often revolve around the confusion between hemp and marijuana. It’s natural. They look very similar, and people use the word "cannabis" interchangeably between the two, but having a bit of knowledge gives you a massive advantage. 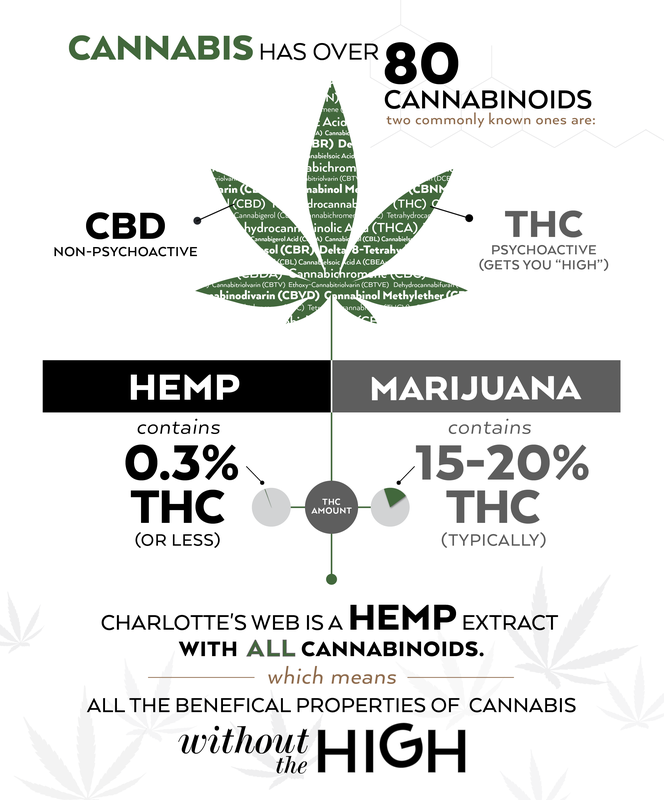 Understanding the difference allows you to easily access reliable and legal cannabis for tremendous wellness benefits, like Charlotte’s Web whole-plant cannabinoid hemp oil extract without the high and the hassle. They both get you high, right? No. Marijuana is cannabis, but hemp isn’t? No. Hemp and marijuana are both elevated in THC? No. You need a medical marijuana card to get them? No. For the more detailed explanation, cannabis is the plant genus for both hemp and marijuana and played a critical role in humankind's industry and health for thousands of years. Ancient societies widely and wisely used cannabis for a variety of wellness and industrial applications. Even though we’ve seen millions of people benefit from cannabis and the laws are changing faster than ever; unfortunately, some of today’s society still carries a stigma about cannabis. Clearly, this stigma is unwarranted. Even the US government is aware of the many benefits of cannabis, having encouraged farmers to grow cannabis for industrial use during World War II's "Hemp for Victory" campaign . Later, they patented "cannabinoids as antioxidants and neuroprotectants." US Patent 6630507  outlines the specific potential for stroke, brain trauma, Alzheimer's and other conditions. So, what changed? Why were we suddenly taught to believe cannabis is the devil's plant - capable of killing brain cells and making us crazed, immoral losers? Conspiracy factualists may point out this demonization conveniently worked in the favor of the powerful Mellon and DuPont families. The same families who bankrolled support for the cannabis prohibition act of 1937. They and other influential elites were looking to exert more control over the paper, textile, fuel and pharmaceutical industries which hemp farmers threatened. Regardless, the demonization of this plant only began in the mid 20th century, which was a huge about-face after centuries of productive use. Furthermore, while the plant contains over 80 different cannabinoids , the smear campaign targeted the only one that results in a psychoactive "high": Tetrahydrocannabinol or THC. In 2014, the US Farm Bill  officially classified cannabis plants containing a maximum of 0.3% THC as "Industrial Hemp" (and all other cannabis as "marijuana"). This means that 99.7% of the plant material will not get you high. 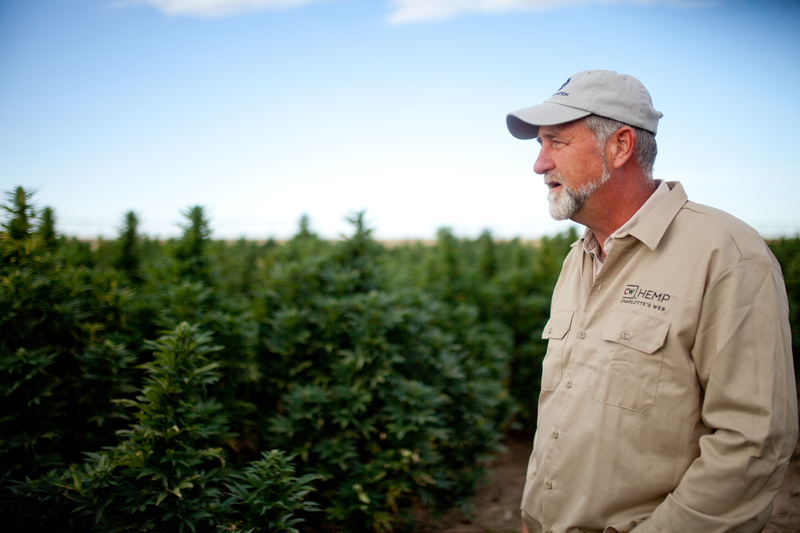 While not perfect, the 2014 Farm Bill was landmark legislation and made it possible to cultivate hemp using modern agriculture processes and to ship beneficial hemp products across state lines. Most importantly, it makes available cannabinoids' natural health benefits for millions of people who need them, but don't want to feel high. With the recent interest in medical marijuana exploding across dozens of states, another cannabinoid, cannabidiol, has gained global attention. It’s often referred to as “CBD." Like THC, cannabidiol is a single cannabinoid found among the over 80 other cannabinoids in cannabis. Unlike THC, cannabidiol is non-psychoactive and can be found in hemp and marijuana. Despite dozens of companies ignoring the law, the FDA has said that products labeled as "CBD" cannot be legally sold across state lines in the United States . This is due to evolving medical regulations and quality concerns. The FDA recently tested 20 "CBD" products  and found that nearly half of them contained zero CBD, while most of the others had near meaningless levels of CBD, and several contained toxic contamination. Charlotte's Web hemp extract oil’s natural cannabinoids are often confused with CBD because many people's first contact with CBD came from the "medical marijuana" story of little Charlotte Figi . After exhausting medical options, Charlotte's parents gave her a low-THC hemp extract oil containing proprietary, whole-plant cannabinoids bred expertly by the Stanley Brothers. Today, little Charlotte is thriving! In honor of Charlotte's astonishing results, this same oil became known as "Charlotte's Web." After the Farm Bill and rigorous testing by the Colorado Department of Agriculture, Charlotte's Web was officially classified as "hemp" and began shipping to all states. Despite media coverage, "CBD" has never been an accurate description of Charlotte's Web. It’s always been a whole-plant hemp extract oil that contains all beneficial cannabinoids, not a single-compound product. Lastly, now that you know the differences between hemp and marijuana, we recommend that you always seek quality and consistent whole-plant cannabinoids for optimal wellbeing. While world-class genetics are the foundation of Charlotte’s Web, quality is in the details. The unmatched care that goes into the production of Charlotte's Web products is overseen entirely by the Stanley Brothers from cloning, hand-planting, organically growing on US family farms, and manufacturing in an FDA certified facility with 3rdparty verified Good Manufacturing Practices. No one else does this! Don’t be shy about asking this and more in the comments below and check out our FAQs page too! 1 Hemp for Victory. Directed by Raymond Evans, narrated by Lee D. Vickers, U.S. Department of Agriculture, 1943. 2 The United States of America as represented by the Department of Health and Human Services. "Cannabinoids as antioxidants and neuroprotectants." Patent 6,630,507. 7 Oct 2003. 3 Ben Amar, Mohamed. "Cannabinoids in medicine: A review of their therapeutic potential." Journal of Ethnopharmacology, 105, 2006, 1-25. 4 United States Department of Agriculture. "The Farm Bill | USDA." United States Department of Agriculture. USDA, 13 July 2015. Web. 20 Oct. 2016. 5 Long, Josh. "FDA: Products Containing CBD Cannot Be Sold as Dietary ..." Natural Products Insider. Informa Exhibitions, 20 May 2015. Web. 20 Oct. 2016. 6 FDA. "2015 Warning Letters and Test Results for Cannabidiol ..." U.S. Department of Health and Human Services. U.S. Food and Drug Administration, 31 Aug. 2016. Web. 20 Oct. 2016. FDA. "2016 Warning Letters and Test Results for Cannabidiol ..." U.S. Department of Health and Human Services. U.S. Food and Drug Administration, 31 Aug. 2016. Web. 20 Oct. 2016. 7 Young, Sandra. "Marijuana stops child's seizures." CNN. 7 Aug 2013. Web. 29 Nov 2016.